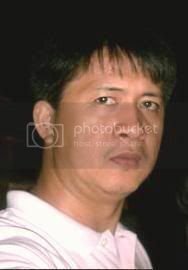 Roy is a widower from Angeles City. He maintains over 10 blogs including Roysville dot Com, The Struggling Blogger, Short Stories Blog, Travel To Angeles City, and Kapampangan Blog, and sees blogging not as a hobby but as a way of life. Why do I have to meet you now? "I Can Only Dream Of You"
Reyjr: The song speaks about one of love's tragedies - an unattainable love. What was the inspiration for the lyrics of this song, Roy? Roy: I love playing 'made up' scenes in my mind, although this was inspired by a friend's story at the time. Didn't really realize that all my works would be applicable to me someday... oops! Reyjr: Haha. Interesting stuff. Do you enjoy writing music? How do you come up with the melodies for your songs? Roy: I started writing poems first, and then I learned how to play the guitar. So I toyed up with the idea of putting melodies on some of my poems. Soon, I was composing songs and poems separately. I'm not really a musician, so I just do a "trial & error" of sorts, until I'm satisfied with it. Reyjr: Where did you learn how to play the guitar? Reyjr: A lot of us can relate to that. I started singing in the church choir myself. :) How important is music to you? Roy: Very important. Just like poetry and blogging. Music is just one way of expressing myself. Like what I always say, I'm not really much of a talker, and I express myself better in writing. Music adds more to the 'effectiveness' of that self-expression. Reyjr: Do you see yourself writing more songs in the future? Roy: As long as I can, I will write songs. Maybe they may not see their time in the airwaves in my lifetime. But at least I can leave them with my kids, who are far better musicians than I am. Hopefully, sometime... somewhere... something will happen soon. Reyjr: Go for it, Roy. :) Thank you!